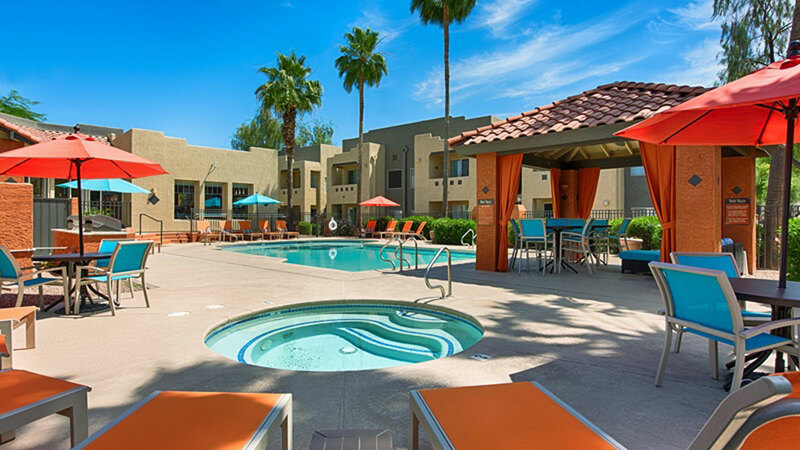 Phoenix, AZ – December 21, 2017 – ABI Multifamily, the Western US's leading multifamily brokerage and advisory services firm, is pleased to announce the $41,000,000 / $155,303 Per Unit sale of the 264-unit, Palm Valley Apartment Homes in Goodyear, AZ. Palm Valley, originally built in 1997/98, features spacious 1, 2 and 3-bedroom units with a weighted average size of approximately 893 square feet with full size washer/dryer in each unit and fireplaces in select units. "The Seller has done a tremendous job in renovating a large majority of the unit interiors at Palm Valley Apartment Homes," states Rue Bax, Senior Managing Partner at ABI. "This repositioning of the property, along with the renovation of the clubhouse and the numerous exterior upgrades, has driven the rents at Palm Valley Apartment Homes to some of the strongest in the submarket. The Buyer, a private investment firm based in Colorado, was seeking to find a stable, high quality asset to purchase and continue to improve and in an area outside of urban core districts where they could further maximize value. Palm Valley Apartment Homes, above all else, offers a premiere location that is extremely challenging to replicate in the submarket and offers the new owners tremendous upside without significant risk." The Palm Valley Apartment Homes are located in Goodyear's premiere 9,500-acre Palm Valley Master Planned Community and are just minutes from all major West Valley transportation corridors of I-10, Loop 101 and the newly opened Loop 303. The property is also just a short walk to the acclaimed Palm Valley Golf Club which boasts a 36-hole championship course with an Arthur Hills-designed par-72 course that covers 7,015 yards. Palm Valley Apartment Homes sit on just over 16-acres of land, with 19 total buildings and a dedicated leasing center/clubhouse. Palm Valley is a solid and highly sought after "A" class community, with over 60% of its unit mix comprised of 2 and 3-bedroom units, and situated in an "A" location. The Buyer, Capital Real Estate, LLC, is a private investment firm based in Colorado. Since its formation in 2005, CRE has purchased 33 properties representing a total capitalization of approximately $790 million, including approximately $41.5 million in equity. Their portfolio currently consists of 27 properties with 6,204 units. The Seller, Benedict Canyon Equities, is a private investment firm based in California. As of November 2017, they have acquired, rehabilitated, and asset managed 104 properties (14,521 units) throughout California, Colorado and other select states, with a total value over $2.16 Billion. The Phoenix based ABI Multifamily brokerage team of Rue Bax, Alon Shnitzer, John Kobierowski, Doug Lazovick and Eddie Chang negotiated the transaction.